Whether it's the creation and execution of an entire communication plan, a workshop, or video, stories come in many forms. Here are some samples of work we've done in multiple mediums. Big Ad is dead... and this is the future of marketing. The strategic sharing of stories to build trust, community, and impact. 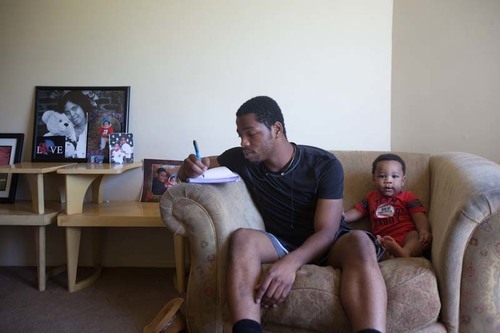 This year, Detroit faced the largest tax foreclosure crisis in U.S. history - with up to 100,000 residents living in homes that were at risk of foreclosure. Final 5 was hired by the United Way to build and implement a plan to find and share stories of residents going through foreclose, in order to help shape and share the narrative. As seen in the Facebook campaign, Because Someone Lives Here, thousands of community members rallied around the families impacted by the crisis. A combination of images, captions, and videos, our largest success was Latina (pictured) whose image went viral. Laozi says that the journey of a thousand miles begins with a single step. Do you tell Badass Stories? You should. We can help you take the first step and the last. Story can shape lives, it can shape communities, and it can shape outlooks. Such was the story of Much Love. After an intense, touching, and reflective three months we revealed a mini-documentary that has been viewed all over the world, created more impact than any other United Way campaign piece, and "forever altered the trajectory of the organization," according to UWSEM CEO Mike Brennan. We have kept in touch with the student pictured to the right, Kymoni, for years and our Founder, Matt, wrote a quick update on life after high school. They come in, put a camera in your face, ask you questions, and prompt you to come up with canned responses. All while your coworkers are standing around listening to your every word. Don't forget that your manager will see this video as well - better not say anything that will get him in trouble. Determined to get beneath the surface, we approach it differently - spending time with the employees we interview and building a relationship with them. At the end of the project, we often hear how much we're liked and how different we are. "You guys listen and let us actually share our stories."